Four years ago in El Salvador, single mother Evelyn Martinez-Palacio found herself in a predicament. She no longer had anywhere to live, and nowhere she found to rent was affordable for her family. Faced with no other option, Evelyn moved herself and her children into a notoriously dangerous area on the outskirts of their city, where they constructed their own home entirely out of plastic and bamboo. With some luck, they came across some steel sheeting and made a roof. During this time, Victoria, Evelyn’s mother, would care for the children while Evelyn worked at a factory, sewing clothes for export to the United States. Victoria was responsible for all the daily activities, including water retrieval. “I have a back problem, and I can’t carry the water myself. I either have to send the children, or I pay someone to do it for us. It takes four trips to get enough for one day,” described Victoria of her daily routine. Two years ago, feeling increasingly frustrated with her options, Evelyn came up with a plan to help her family. That plan included illegally immigrating into the United States, leaving her three children behind in the care of her mother. “If I had a decent home, I would not leave my family. I’d work in my country and raise my kids. I don’t want to be away from them,” said Evelyn of her situation. 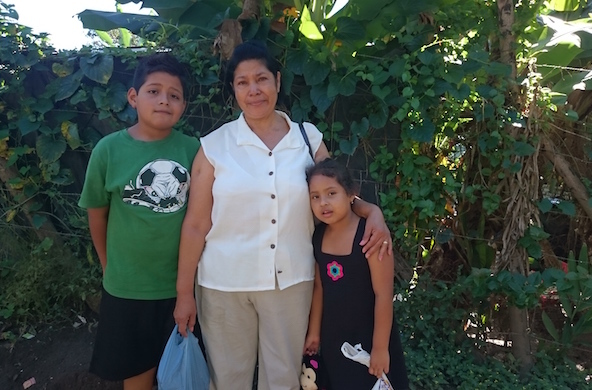 Feeling backed into a corner, Evelyn felt that she had to choose: stay in El Salvador and continue raising her children in poverty, or illegally work in America until she was able to make sustainable changes for her children. Thanks to the Fuller Center partnerships in El Salvador, that drastic move was not necessary. As Fuller Center partners told Victoria that her daughter would be receiving “a good, safe house, where water will work and the kids can play,” Victoria was rendered speechless, and the tears flowed freely. It seems that her hard work has paid off, as Evelyn and her family moved into their new home this month.